Our fifth Rescuer Happy Hour is happening this April! Join our extra-special senior dog foster and adoption event in LA, hosted by Foster Dogs Inc. & Susie's Senior Dogs. Adopt, foster, or just come for doggy kisses! Hosted by Foster Dogs Inc. Puppy Party is 4 to 6 PM. Our fourth Rescuer Happy Hour is ON! Lucy & Co Merchandise "Takeover"
Hosted by Lucy & Co. Come meet adoptable dogs! Grab some coffee, and buy some merch. Proceeds to benefit Foster Dogs Inc.
Join us for our 2nd Annual Foster Trivia Night at dba East Village! 2nd Annual PetCon is happening! Foster Education Series: Big Dogs! Join us to learn about fostering BIG dogs in NYC! Hosted by BARK. Bring your pup and join us at Monica Vinader for a Holiday Shopping Party. Find the perfect gift for your dog walker, your pup's best friend, or even yourself. 'Tis better to give than to retrieve! Free nibbles, sips, and on-site engraving during the event! And 20% of all proceeds from the night go to Foster Dogs, Inc.! Bring your pup and join us at Boris & Horton. Grab a brew while your dog snags a chew. Every pup gets a free toy from our new Season's Treatings line and their human gets a free drink! Event and raffle proceeds will be donated to Foster Dogs, Inc.
Saturday 10/20, join us for a HOWLoween Carnival hosted by Dog & Co! Come stop by Turnstyle Shopping Center from 12-4 for “ghostly games, terrifying treats, freaky photo booth and adorable adoptables!” Costumes highly encouraged! Professional photos by @nycpetphotographer, at BARK! Celebrating our senior-dog pals Tugboat Pugboat and Albie “Albert Einstein,” part of our amazing Chloe’s Fospice Friends program. Says mom Tracy, “Bring your dog and your friends and celebrate with us on Wednesday from 6:30-8:30PM at Boris & Horton in the East Village and our special guests, adoptable senior and special needs dogs from Animal Haven and Shelter Chic! We will also have Foster Dogs Inc there repping the best program ever, #ChloesFospiceFriends, and cake for dogs by Maison de PawZ and cake for people too! We are so excited and can't wait to see you there! BARK writes, “Bring your pup and join us at Bluestone Lane. Get ready for drinks, toys, and more adorable dogs than you can shake a tail at. Every pup gets a free toy and their human gets a free drink! Event and raffle proceeds will be donated to Foster Dogs, Inc.” This event is organized by BARK, the makers of BarkBox. Strut Your Mutt with team Foster Dogs Inc! Celebrate the life of Chloe Kardoggian with donations benefiting #Fospice program! [Sold out!] 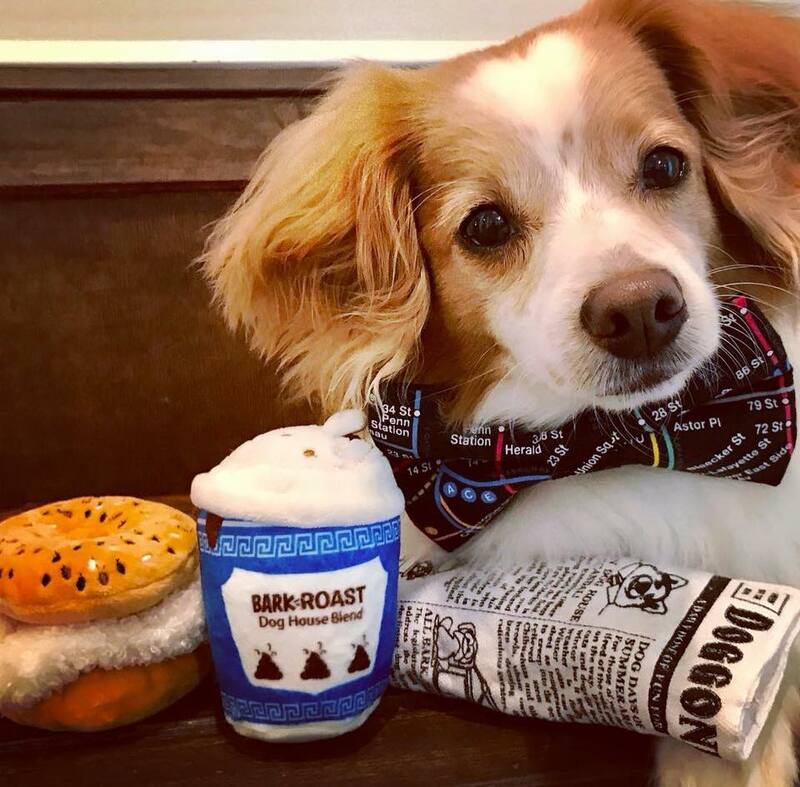 Snack on pizza and sip on a beer while our guest facilitator, ASPCA's Rachel Cohen Maso, empowers you to be the best foster/rescue dog caretaker you can be! Hosted by Lucy & Co. . Proceeds to benefit Foster Dogs Inc. Hosted by @maisondepawZ at Boris & Horton. Proceeds to benefit Foster Dogs. Co-hosted by Foster Dogs Inc. and Bark, Puppy Party is 5 to 7 PM with 30-45 min panel discussion.